The artist still known as Steve Clark has been writing and performing his songs for nearly 4 dog-years. 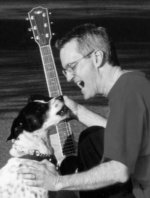 He is a member and past president of the Southwest Virginia Songwriters Association (SVSA) and pounds the pavement regularly with his dog, Spot. His recent release, "Dog Joggin' " features 11 of his own songs along with a few favorites by other celebrated songwriters. His song "Up Up Up" was a finalist in the Children's category of the 1995 songwriting competition of the Louisville Area Songwriters' Cooperative. An “Alumnus” of the Swannanoa Gathering, he performs at venues in the Roanoke valley. "I met Spot eight years ago and was impressed by his coat, exuberance, and sneakers. He said that Steve was planning a CD project and asked if I'd put his songs on my label. Well, you just don't trot out anything before the public, but when I heard these unique, creative, and well crafted songs, I knew they were ready to be unleashed. Though Steve claims to have written them himself, you can guess who really deserves the credit. It's a dog's life." -Kira Pole-Trafidlo, CEO, Kira Records.